EDrive Traction Gel batteries are 100% maintenance-free. Not only does this mean a significant reduction in labour costs but it is also an extremely safe solution. EDrive Traction Gel consists of completely sealed cells, which means there is no risk whatsoever of acid leakage or gas formation. For companies with extremely stringent safety regulations, such as those in the chemical, pharmaceutical and food industries, these batteries are an excellent solution. Thanks to B.M.S., we can gain clear insights into the usage, maintenance and the exact technical status of your batteries. 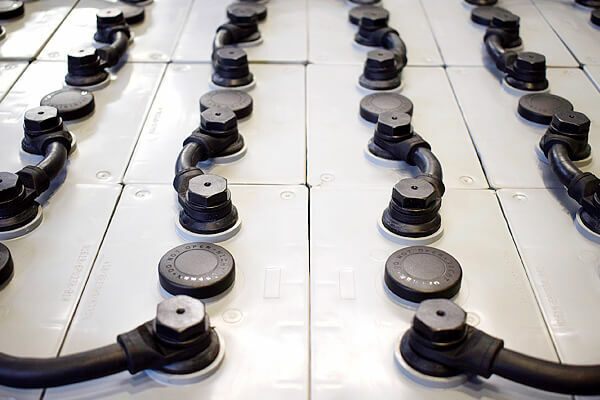 Using various sensors, the system registers all charge and discharge cycles of the battery. Using B.M.S. can extend the guarantee period of your battery by up to 4 years. Please contact Emrol to discuss the possibilities.